Childhood Fourth of July's We're Some Of The Best! Memories come from unexpected places. Something causes us to reflect on times of our past. Something that we experience feels similar to times gone by. This picture, and the memories triggered by the items that are in it, transported me back to my youth like a shot through a time capsule. This grouping of memorabilia was in a display case at Blueberry Hill's Farm and Restaurant in Manson, Washington. I spotted it for the first time when my family and I visited there last year. It was one of many such visits that we make several times each summer for their world-class breakfast. Why I hadn't noticed it previously I don't know, but I recorded it in a picture and saved it for nearly a year. Today is the right time to share the picture and the memories it triggered. This isn't a story about great breakfasts or great times during summers in Chelan. No, this picture took me back farther than either of those memories could. This memory puts me in Lake Stevens, Washington as a five, six, seven or eight. 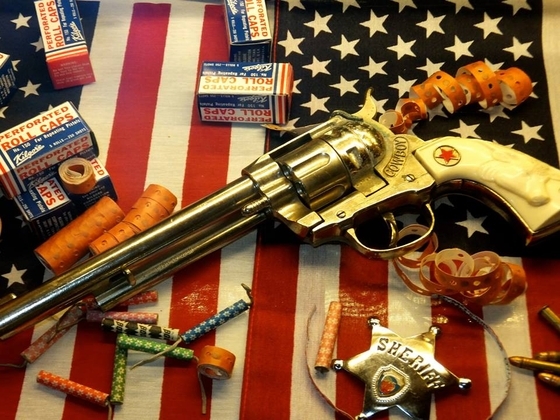 It's about Fourth of July's with cap gun six shooters. It's about our family loading up the car for a short drive to Everett in order to enjoy the annual Fourth of July parade in the morning,. It's about cousins, aunts, and uncles all descended on one of the family homesteads for potluck dinners, pinochle games, horseshoes and just plain fun. And, of course it's about cap guns, sparklers, Picolo Pete's and colorful fountains as sunset faded into darkness. Now, as a sixty-year-old man who has raised children into adults ranging from 20 to 35 years old, I've seen a lot of Fourth of July celebrations. And still, I don't think I have any stronger memories than those this picture took me back to. I hope it might do the same for some of you. Happy Independence Day to all my friends, and family b- and to all you baby boomers who remember lighting black pellets that turn into magic snakes on a sidewalk, or that smashed the whole roll of caps with a hammer or rock. Those were the days. Jul. 5, 2013 What a great photo! My entire family used to get together each 4th at our cabins on Mt. Palomar in California. The cowboy/indian battles were unreal with a few dozen kids running around. Snipe hunts, amazing barbeque, and late nights looking up at the stars are some of my fondest memories. Oh, and the, what seemed like, 2 mile hike to the lake for a little fishing where someone inevitably would fall into the stinging nettle. Each year, fewer and fewer people would make the trip. Eventually all the cowboys and indians grew up and moved away. The property was recently put up for sale as there were too few that were interesting in continuing to fund it. Though the place may be gone, and the people have changed, I will always have those memories. It's those experiences that keep me motivated so that I may be able to replicate and share them with the people I hold dear today.